Objectives: The objective of this study is to compare the shear bond strength (SBS) of stainless steel (SS) orthodontic brackets bonded with four different orthodontic adhesives. Materials and Methods: Eighty newly extracted premolars 0 were bonded to 0.022 SS brackets (Ormco, Scafati, Italy) and equally divided into four groups based on adhesive used: (1) Rely-a-Bond (self-cure adhesive, Reliance Orthodontic Product, Inc., Illinois, USA), (2) Transbond XT (light-cure adhesive, 3M Unitek, CA, USA), (3) Transbond Plus (sixth generation self-etch primer, 3M Unitek, CA, USA) with Transbond XT (4) Xeno V (seventh generation self-etch primer, Dentsply, Konstanz, Germany) with Xeno Ortho (light-cure adhesive, Dentsply, Konstanz, Germany) adhesive. Brackets were debonded with a universal testing machine (Model No. 3382 Instron Corp., Canton, Mass, USA). The adhesive remnant index (ARI) was recordedIn addition, the conditioned enamel surfaces were observed under a scanning electron microscope (SEM). Results: Transbond XT (15.49 MPa) attained the highest bond strength. Self-etching adhesives (Xeno V, 13.51 MPa; Transbond Plus, 11.57 MPa) showed clinically acceptable SBS values and almost clean enamel surface after debonding. The analysis of variance (F = 11.85, P < 0.0001) and Chi-square (χ2 = 18.16, P < 0.05) tests revealed significant differences among groups. 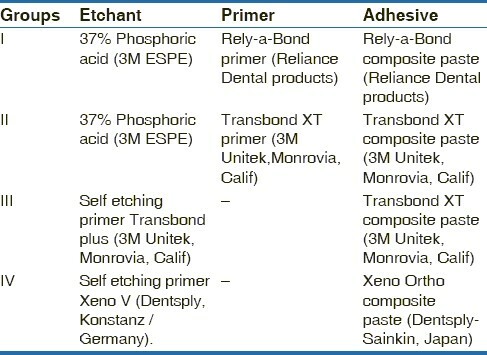 The ARI score of 3 (i.e., All adhesives left on the tooth) to be the most prevalent in Transbond XT (40%), followed by Rely-a-Bond (30%), Transbond Plus with Transbond XT (15%), and Xeno V with Xeno Ortho (10%). Under SEM, enamel surfaces after debonding of the brackets appeared porous when an acid-etching process was performed on the surfaces of Rely-a-Bond and Transbond XT, whereas with self-etching primers enamel presented smooth and almost clean surfaces (Transbond Plus and Xeno V group). Conclusion: All adhesives yielded SBS values higher than the recommended bond strength (5.9-7.8 MPa), Seventh generation self-etching primer Xeno V with Xeno Ortho showed clinically acceptable SBS and the least amount of residual adhesive left on the enamel surface after debonding. Tavas and Watts  first described the use of light-cured materials in vitro for orthodontic bonding. In the direct bonding technique, the material is cured under metal-based brackets by direct illumination from different sides and by trans-illumination because the tooth structure transmits visible light. Rapid polymerization occurs when visible light is applied, producing a "command set" that is of great advantage; such setting "on demand" results in a nearly unlimited working time, allowing more accurate bracket placement. Newer self-etching adhesive materials have been introduced recently in orthodontics to simplify the bonding process by reducing the bonding steps and eliminating the need for etching and priming, thus lessening the risk of contamination and reducing the bonding time. These self-etching primers combine the conditioning and priming agents into one acidic solution and have shown advantages such as reduced loss of enamel, prevention of saliva contamination and less chair time. An ideal orthodontic adhesive should have adequate bond strength while maintaining unblemished enamel after debonding. Therefore, researchers have been working hard to achieve the best quality and gentlest procedures for bonding orthodontic brackets. A gentler etch pattern has been obtained with self-etching primers, and scanning electron microscope (SEM) studies have shown that these conditioners yield shorter resin tags. In their study Hosein et al. they found that the least enamel loss occurs when a self-etching primer is used for conditioning and the enamel is cleaned up with a slow-speed tungsten carbide bur. The purpose of this study was to evaluate and compare the SBS of orthodontic brackets bonded with four different orthodontic adhesives. The study was approved by the Ethics Committee of the Research Cell, King George Medical University, Lucknow, India. Eighty newly extracted premolars were collected and stored in a solution of 0.1% (wt/vol) thymol. The criteria for tooth selection were similar to those described by Bishara et al. The teeth were cleansed and pumiced by using a rubber cup with fluoride-free paste for 10 s, thoroughly washed with water, and air-dried. Stainless steel Siamese premolar brackets (Ormco, Scafati, Italy) were used, with the 0.022 slot. The surface area of bracket base was 11.15 mm 2 and the mesh size was 80 gauge. The teeth were randomly divided equally into four groups based on the adhesive system used as follows [Table 1]. Group I, teeth were etched with 37% phosphoric acid. The brackets were then bonded with Rely-a-Bond (Reliance Orthodontic Product Inc., Illinois, USA). It has two components : a0 n activator primer liquid placed on the tooth and the adhesive paste placed on the bracket. Group II, the teeth were etched (37% phosphoric acid for 30 s), washed with water, and dried to a chalky white appearance. An adhesive primer was applied to the etched surface; the bracket was placed on the tooth and bonded with Transbond XT (3M Unitek, CA, USA). Group III, the teeth were conditioned with Transbond Plus self-etching primer (3M Unitek, CA, USA) which uses a lollipop system with two compartments : o0 ne that contains methacrylated phosphoric acid esters, initiators, and stabilizers; and the other contains water, fluoride complex, and stabilizers. Both compartments are squeezed out to activate the product, and the contents of each compartment are mixed. The resulting mix is then applied by continuously rubbing the self-etching primer on the enamel surface. The primer was applied for 15 s, lightly dried with compressed air for 1-2 s, and then brackets were bonded with Transbond XT. Group IV, the teeth were conditioned with 7 th generation light-cure self-etching primer (Xeno V, Dentsply, Konstanz, Germany). It is a light-curing, self-etching, one-component adhesive. According to the manufacturer's recommendations it was applied in two layers, photopolymerized for 15 s, light application of an air jet was then used, and it was light-cured for 10 s. The brackets were then bonded with Xeno Ortho light-cure adhesive resin (Dentsply, Konstanz, Germany). In all groups, except Group I, the brackets were light-cured (0 377-490 nm of wavelength, Smartlite, 0 Dentsply, Milford, DE, USA) for a total of 20 s, with the light beam directed for 10 s at each of the mesial and distal faces. These bonded teeth were fixed in acrylic resin, and stored in distilled water at 37°C for 24 h. An occluso-gingival load was applied to produce a shear force at the bracket-tooth interface. This was accomplished with the flattened end of a steel rod attached to the crosshead of a universal testing machine (Model No. 3382 with max. load of 100 KN, Instron Corp., Canton, Mass, USA). A mounting jig was used to align the facial surface of the tooth to be parallel to the force during the SBS test. The bond strengths were measured at a crosshead speed of 1 mm/min, and the load applied at the time of fracture was recorded in Newton and then calculated by dividing the debonding force by the bracket base surface area yielding megapascals (MPa) as a unit. 0, no adhesive left on the tooth. 1, less than half of the adhesive left on the tooth. 2, more than half of the adhesive left on the tooth. 3, all adhesive left on the tooth, with a distinct impression of the bracket mesh. Selected surfaces of each group were also examined under SEM (ZEISS DSM 950, Germany) to observe enamel surface after debonding. The mean SBS of the four groups was compared by one-way analysis of variance (ANOVA) and the significance of the mean difference between the groups was done by Tukey post-hoc test. Discrete (categorical) ARI scores of four groups were compared by Chi-square test. A two-tailed (α = 2) P < 0.05 was considered as statistically significant. The SBS values (in MPa) and descriptive statistics for all groups are shown in [Table 2]. One-way ANOVA revealed statistically significant (F = 11.85, P < 0.0001) differences in SBS among various groups. Therefore, pairwise comparison between the groups was done by post-hoc Tukey test. Tukey test revealed that the mean SBS values for groups Transbond XT and Xeno V were significantly higher than those for groups Rely-a-bond and Transbond Plus. The ARI scores for adhesive remaining of the four groups are summarized in [Table 3]. The ARI score of 3 (i.e., all adhesive left on the tooth) of Transbond XT was found to be the most prevalent (40%), followed by Rely-a-bond (30%), Transbond Plus (15%), and Xeno V presented with the least (10%). On comparing, the ARI scores among the groups, Chi-square test revealed significantly (P < 0.05) different scores among the groups. In other words, all adhesives left on the tooth of Transbond XT group was significantly higher when compared to specially Transbond Plus group and Xeno V group. Contemporary two-step self-etching primer and the new one-step self-etching adhesive systems are attractive additions to the clinician's bonding armamentarium. ,, The bond strength of the orthodontic bracket must be able to withstand the forces applied during the orthodontic treatment. In orthodontics, an adequate bond, which fails at the enamel-composite interface, would be desirable because debonding and subsequent polishing would become much easier. In this study, mean SBS of Transbond XT was 15.49 Mpa, which was the highest among all groups and correlates with other studies. Pickett et al. and Arnold et al. who reported SBSs of 11.2 and 9.7 MPa, for conventional acid-etch adhesive and Transbond XT, respectively. However, Scougall Vilchis et al. compared Transbond XT (control group) with Transbond Plus and other three self-etching adhesives and found that the SBS of Transbond XT was highest (19.0 MPa), followed by Transbond Plus (16.6 MPa) and three other self-etching adhesives. According to the present study, the SBS of Rely-a-Bond was 12.26 Mpa. The findings of this study are consistent with the study of Toledano et al.,  who evaluated the SBS of different self-cure and light-cure composite and found that the SBS of self-cure composite was 13.71 MPa. In this study, SBS of Transbond Plus with Transbond XT was 11.57 MPa. Trites et al. compared the SBS of two self-etching primers (Transbond Plus and First Step) with the control (Transbond XT) and found SBS of control (Transbond XT) was 12.71 MPa followed by Transbond Plus (10.96 MPa) and First Step (5.30 MPa). The ARI is one of the most commonly used methods of assessing the quality of adhesion between the composite and tooth as well as between the composite and bracket base. , In this study, the ARI score of 3 (i.e., all adhesive left on the tooth) was found to be the most prevalent in Transbond XT (40%), followed by Rely-a-Bond (30%), Transbond Plus with Transbond XT (15%), and Xeno V with Xeno Ortho (10%). The SEM findings can be related to the values of the SBS and ARI, because, when the enamel surface was more affected by the conditioner, greater bond strength and more adhesive remnants were found, as in Transbond XT group. On the other hand, when the gentler etch pattern of self-etching primers was observed, there were lower mean values of SBS and ARI scores (Transbond Plus group and Xeno V group). Under SEM, enamel surfaces after debonding of the brackets appeared porous when an acid-etching process was performed on the surfaces of Rely-a-Bond and Transbond XT [Figure 1], whereas enamel that was treated with self-etching primers presented smooth and almost clean surfaces as in Transbond Plus group and Xeno V group [Figure 1]. The teeth in Transbond Plus group had the cleanest overall surfaces, often reflecting the original perikymata. In Rely-a-Bond, type II enamel etching pattern was found, which is indiscriminate and rough. Based on this study, the highest SBS was observed in Transbond XT, followed by Xeno V with Xeno Ortho, Rely-a-Bond and lowest in Transbond Plus with Transbond XT. In Transbond Plus with Transbond XT group and in Xeno V with Xeno Ortho group, most of the adhesive remained on the bracket (ARI scores of 0 and 1), indicating failure at the enamel-adhesive interface. Whereas, in Transbond XT group and Rely-a-Bond group, most of the adhesive remained on the tooth (ARI scores of 2 and 3), indicating failure at the bracket-adhesive interface. Under the SEM, enamel surfaces of Transbond XT and Rely-a-Bond seemed more porous and rough with the type III etching pattern after debonding. 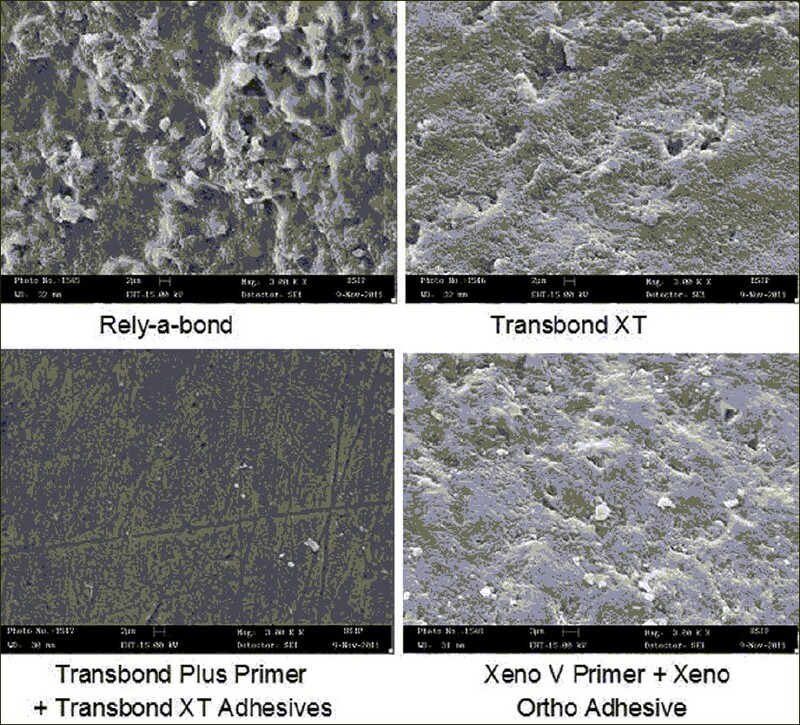 However, in Transbond Plus with Transbond XT and Xeno V with Xeno Ortho, enamel surfaces presented smooth and almost clean surfaces after debonding. The latest generation self-etching primer Xeno V with Xeno Ortho showed clinically acceptable SBS and less amount of residual adhesive left on the enamel surface after debonding. 1. Buonocore MG. A simple method of increasing the adhesion of acrylic filling materials to enamel surfaces. J Dent Res 1955;34:849-53. 2. Newman GV. Epoxy adhesives for orthodontic attachments: Progress report. Am J Orthod 1965;51:901-12. 3. Joseph VP, Rossouw E. The shear bond strengths of stainless steel and ceramic brackets used with chemically and light-activated composite resins. Am J Orthod Dentofacial Orthop 1990;97:121-5. 4. Tavas MA, Watts DC. Bonding of orthodontic brackets by transillumination of a light activated composite: An in vitro study. Br J Orthod 1979;6:207-8. 5. Reynolds IR. A review of direct orthodontic bonding. Br J Orthod 1975;2:171-8. 6. Bowen RL. Use of epoxy resins in restorative materials. J Dent Res 1956;35:360-9. 7. Hosein I, Sherriff M, Ireland AJ. Enamel loss during bonding, debonding, and cleanup with use of a self-etching primer. Am J Orthod Dentofacial Orthop 2004;126:717-24. 8. Bishara SE, Gordan VV, VonWald L, Olson ME. Effect of an acidic primer on shear bond strength of orthodontic brackets. Am J Orthod Dentofacial Orthop 1998;114:243-7. 9. Zachrisson BU, Skogan O, Höymyhr S. Enamel cracks in debonded, debanded, and orthodontically untreated teeth. Am J Orthod 1980;77:307-19. 10. Artun J, Bergland S. Clinical trials with crystal growth conditioning as an alternative to acid-etch enamel pretreatment. Am J Orthod 1984;85:333-40. 11. Owens SE Jr, Miller BH. A comparison of shear bond strengths of three visible light-cured orthodontic adhesives. Angle Orthod 2000;70:352-6. 12. Vahid-Dastjerdi E, Borzabadi-Farahani A, Pourmofidi-Neistanak H, Amini N. An in-vitro assessment of weekly cumulative fluoride release from three glass ionomer cements used for orthodontic banding. Prog Orthod 2012;13:49-56. 13. Eliades T. Orthodontic materials research and applications: Part 2. Current status and projected future developments in materials and biocompatibility. Am J Orthod Dentofacial Orthop 2007;131:253-62. 14. Borzabadi-Farahani A, Borzabadi E, Lynch E. Nanoparticles in orthodontics, a review of antimicrobial and anti-caries applications. Acta Odontol Scand 2013. 15. Bishara SE, VonWald L, Laffoon JF, Warren JJ. Effect of a self-etch primer/adhesive on the shear bond strength of orthodontic brackets. Am J Orthod Dentofacial Orthop 2001;119:621-4. 16. Sirirungrojying S, Saito K, Hayakawa T, Kasai K. Efficacy of using self-etching primer with a 4-META/MMA-TBB resin cement in bonding orthodontic brackets to human enamel and effect of saliva contamination on shear bond strength. Angle Orthod 2004;74:251-8. 17. Vicente A, Bravo LA, Romero M, Ortiz AJ, Canteras M. A comparison of the shear bond strength of a resin cement and two orthodontic resin adhesive systems. Angle Orthod 2005;75:109-13. 18. Pashley DH, Tay FR. Aggressiveness of contemporary self-etching adhesives. Part II: Etching effects on unground enamel. Dent Mater 2001;17:430-44. 19. Amra I, Samsodien G, Shaikh A, Lalloo R. Xeno III self-etching adhesive in orthodontic bonding: The next generation. Am J Orthod Dentofacial Orthop 2007;131:160.e11-5. 20. Bishara SE, Otsby AW, Ajlouni R, Laffoon J, Warren JJ. A new premixed self-etch adhesive for bonding orthodontic brackets. Angle Orthod 2008;78:1101-4. 21. Pickett KL, Sadowsky PL, Jacobsen A, Lacefield W. Orthodontic in vivo bond stength : c0 omparison with in vitro results. Angle Orthod 2001;71:141-8. 22. Arnold RW, Combe EC, Warford JH Jr. Bonding of stainless steel brackets to enamel with a new self-etching primer. Am J Orthod Dentofacial Orthop 2002;122:274-6. 23. Scougall Vilchis RJ, Yamamoto S, Kitai N, Yamamoto K. Shear bond strength of orthodontic brackets bonded with different self-etching adhesives. Am J Orthod Dentofacial Orthop 2009;136:425-30. 24. Pithon MM, dos Santos RL, Ruellas AC, Sant'Anna EF. One-component self-etching primer: A seventh generation of orthodontic bonding system? Eur J Orthod 2010;32:567-70. 25. Toledano M, Osorio R, Osorio E, Romeo A, de la Higuera B, García-Godoy F. Bond strength of orthodontic brackets using different light and self-curing cements. Angle Orthod 2003;73:56-63. 26. Trites B, Foley TF, Banting D. Bond strength comparison of 2 self-etching primers over a 3-month storage period. Am J Orthod Dentofacial Orthop 2004;126:709-16. 27. Eslamian L, Borzabadi-Farahani A, Mousavi N, Ghasemi A. The effects of various surface treatments on the shear bond strengths of stainless steel brackets to artificially-aged composite restorations. Aust Orthod J 2011;27:28-32. 28. Eslamian L, Borzabadi-Farahani A, Mousavi N, Ghasemi A. A comparative study of shear bond strength between metal and ceramic brackets and artificially aged composite restorations using different surface treatments. Eur J Orthod 2012;34:610-7. 29. Al Shamsi A, Cunningham JL, Lamey PJ, Lynch E. Shear bond strength and residual adhesive after orthodontic bracket debonding. Angle Orthod 2006;76:694-9. 30. Bishara SE, Ostby AW, Laffoon JF, Warren J. Shear bond strength comparison of two adhesive systems following thermocycling. A new self-etch primer and a resin-modified glass ionomer. Angle Orthod 2007;77:337-41. 31. Al-Saleh M, El-Mowafy O. Bond strength of orthodontic brackets with new self-adhesive resin cements. Am J Orthod Dentofacial Orthop 2010;137:528-33. 32. Jou GL, Leung RL, White SN, Zernik JH. Bonding ceramic brackets with light-cured glass ionomer cements. J Clin Orthod 1995;29:184-7. 33. Swartz ML, Phillips RW, Rhodes B. Visible light-activated resins - Depth of cure. J Am Dent Assoc 1983;106:634-7. 10 Orthodontic Metallic Lingual Brackets: The Dark Side of the Moon of Bond Failures?